This week, I was invited to give a presentation on the history of Wayne State University School of Medicine during its Sesquicentennial Celebration. Yes! The WSU SOM is 150 years old, and it has a rich history of diversity, inclusion, and innovation that should be celebrated. Interestingly, the history of the Medical School is the history of the University, as the University grew out of the Medical School. While I can't cover the entire history in a single blog post, I will give some highlights from the early years of the college below. When the full presentation is released later this year, I will post it to the blog as well. Theodore A. McGraw, MD, founder of the Detroit Medical College, which would later become Wayne State University School of Medicine. The Detroit Medical College was founded in 1868 by five returning Civil War Veterans. One can only imagine the horrors that they saw on the battlefield and you can also imagine the inadequacy that they felt in treating wounded soldiers. In the 1860's, aseptic surgical techniques were only beginning to be used and anesthesia was not fully understood. Can you imagine what it might have felt like to be a battlefield clinician, and not having the proper tools or training? Dr. Theodore McGraw, founder of the Detroit Medical College is quoted as saying: "I had discovered in my two years of army activity that I was deficient in that exact knowledge of anatomy that was essential to good surgery. The advent of antiseptic and aseptic surgery, besides, had opened a new field for operative work, that of the abdomen, which demanded a study of anatomical relations which had never been taught in the schools." Dr. Theodore McGraw was focused on both teaching and learning, and that desire is summed up in this quote "We entered into the matter with unbounded enthusiasm – enthusiasm for teaching and developing ourselves." To this end, the charter of the Detroit Medical College elucidated how this would be achieved. In the charter (pictured below), it is written that "Pains will be taken to instruct each Student in PRACTICAL DIAGNOSIS. For this purpose the advanced Students will be called upon in turn to examine patients. After pronouncing a Diagnosis, questions will be asked in relation to differential symptoms... ...Little benefit can result to the Student from seeing cases diagnosticated and treated by the Professor of Practical Surgery and Medicine, unless he is first allowed to exert his own powers, and test his own knowledge, by personal examination of the patients." The Detroit College of Medicine charter from 1868, signed by founding physician Thodore A. McGraw, MD. The charter puts forth the founding principles of the institution. This ethos of having students practice medicine, to serve the community, and to learn by doing, echoes throughout the history of the School of Medicine. This is the very foundation of the University and the key to its enduring greatness. It is also the reason that I chose to attend WSU SOM - I wanted to immerse myself in the diversity of the city and the breadth of clinical opportunities available in Detroit, from serving homeless and uninsured patients in community clinics to learning from some of the leading minds and researchers in the country at the University clinics. At its inception, the Detroit Medical College set up a relationship with Harper Hospital and St. Mary's Hospital, which allowed students to learn from and serve the people of Detroit. The focus is, and has always been, learning by doing. The early photos below illustrate these tenets. 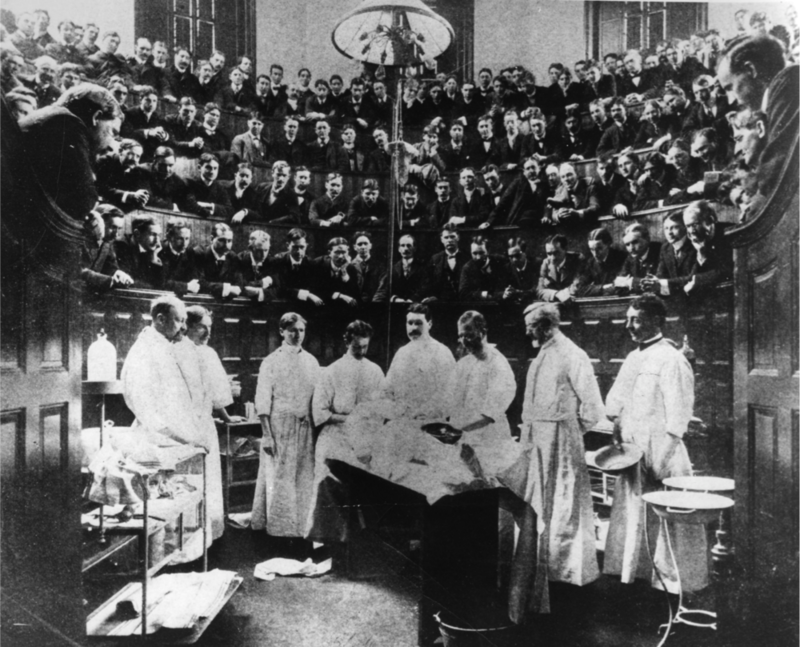 The above photo series include the following images: first is the Detroit Medical College, which housed the medical school after 1868, the second image shows students during anatomy lab sometime around 1900, which is not very different than anatomy lab at the School of Medicine today. The third image is St. Mary's Hospital, one of the two clinical training sites after 1868. The fourth image is the operating theater at St. Mary's Hospital in 1898. The Operator is Dr. Henry O. Walker. At his left, hands behind his back, is Dr. Theodore McGraw, the founder of the Detroit Medical College who emphasized teaching by doing. The final image is Harper Hospital, the primary clinical training site for students at the Detroit Medical College. It was an honor to be able to relay the history of Wayne State University School of Medicine to my physician colleagues this weekend, and it is a great reminder of what makes doctors from Wayne State unique and so skilled - the focus on hands-on clinical training and the diversity of the people we have the privilege of serving.